As the Group of 8 nations prepare for the annual July 2005 Summit in Scotland, the dire development needs of Africa will again come into sharp focus. A recent report on development issues worldwide by the United Nations concludes that Africa is neither on course to meet goals of halving poverty rates by 2015 nor moving significantly to improve access to portable water and basic sanitation. Prime Minister Tony Blair of Britain will host the annual meeting and his government will assume the presidency of the Group of 8 nations until the next annual meeting. 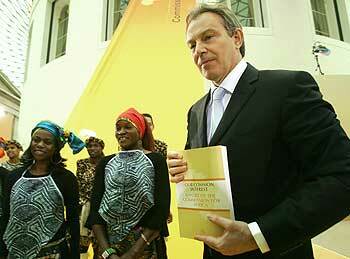 The British government is already off the gates with a major report on development assistance in Africa. To avoid the rhetorical flair of past annual meetings and achieve concrete, verifiable consensus on how best rich nations can assist Africa overcome widespread poverty, I discuss the critical, essential elements of a re-invigorated partnership for development between the Group of 8 and Africa. Africa through its New Partnership for Africa’s Development (N.E.P.A.D.) had articulated major areas of specific development assistance. These areas include urgent debt relief; significant resources for infrastructure development; sustained financial outlays so that Africa can meet the United Nations millennium development goals of halving poverty rates by 2015; and, the end of trade distortions and agricultural subsidies by rich nations so that Africa can trade its way out of poverty through better access to lucrative Western markets. The Group of 8 in the last few annual meetings have emphasized the need for assistance in the areas of communicable diseases control, especially H.I.V./AIDS, the need for verifiable progress in governance and evidence of government-wide crackdown on corruption. As part of Britain’s plan for its presidency of the European Union and presidency of the Group of 8, the Tony Blair Commission on Africa produced a recent report on what the rich nations can do to assist Africa. The British government followed up the report with a four point proposal for Africa’s development by rich nations including 100 percent debt relief for the poorest African nations, with savings set aside for health and education programs; doubling official aid by rich nations by 2015; phased withdrawal of agricultural subsidies and end of trade distortions that make it more difficult for Africa’s goods and services to reach the West; and, the creation of a new global economic program known as the international financing facility that will initially raise funds for age-appropriate immunizations for all children in Africa. What are the critical elements of a renewed partnership between the Group of 8 and Africa? First, Group of 8 and African leaders must be very frank and honest with each other regarding what each partner can bring to the table. For example, Group of 8 nations must be very specific regarding their program for debt relief, including specific timelines for the completion of 100 percent debt relief for specific countries. African governments must state clear specific, verifiable outcome measures of its governance and anti-corruption programs. Without significant progress on debt relief and governance reforms, it would be difficult to envisage a robust, fruitful Group of 8 / Africa partnership in the near future. Ancillary to frankness and honesty in the partnership is the need to manage undue expectations. It is unwise to expect political leaders in the West with an eye on the next competitive domestic election to dramatically increase financial outlays for overseas development assistance when domestic needs deserve urgent attention. It is also unrealistic to expect African governments to wipe out deep-rooted corruption in short order without a resort to undemocratic practices and tendencies. However, to provide assistance to more than 300 million Africans who live on extreme poverty, surviving on less than one dollar a day, Group of 8 nations at the July 2005 Summit have an urgent obligation to provide immediate, 100 percent debt relief for the poorest nations in Africa. Poor African nations should not have to choose between debt servicing and saving the lives of its citizens. Second, the Group of 8 / Africa partnership should move beyond personalization of political leaders to the institutionalization of long-term shared goals, objectives and expected outcomes. It is now a favorite sport to search for “sympathetic leaders” in the West that can “support” development assistance to Africa. Western political leaders know they will be in the good graces of development activists if they visit the continent or visit more often. African leaders trumpet their “closeness” and “rapport” with Western leaders as a democracy dividend to their citizens, even when economic conditions are not improving. The ability to hold 30 to 45 minute meetings with Western leaders is highly prized by current and future political leaders in Africa. Group of 8 nations and African leaders should specify in a transparent way the expectations of each partner. This information should be available to all stakeholders in development assistance for Africa, including the civil society. At the July 2005 Group of 8 Summit the vehicle or platform for implementing Group of 8 / Africa programs and initiatives should be announced. A major weakness of current Group of 8 / Africa dialogue is the lack of clarity on how approved programs and initiatives will be implemented. There are important candidates that can serve as the implementation platforms for Group of 8 / Africa programs and initiatives. Africans will likely press for greater involvement of the African Development Bank and N.E.P.A.D., two important regional institutions. The Group of 8 is likely to focus on World Bank or bilateral development organizations. The key is to reach a quick decision on the best platform for channeling resources for Africa’s development as part of the Group of 8 / Africa partnership. A durable, institutionalized Group of 8 / Africa partnership will replace the current ad hoc meetings and consultations between Group of 8 permanent representatives of political leaders and the leaders of the African Union / N.E.P.A.D. It would also minimize the potential for duplication of programs and wastage of scarce resource when competing bilateral organizations descend on recipient countries. Third, Group of 8 political leaders and their African counterparts need to show visible, verifiable dividends of the partnership. A Group of 8 funded and completed highway from Casablanca, Morocco, North Africa to Cape Town in South Africa will be a dramatic way of showing dividends of the partnership compared to intellectual discussions about “progress” in governance reforms. A Great Lakes region hydroelectric power project will be noticed by ordinary citizens of benefiting countries as they enjoy better and constant electricity supply. Enrolling all African children into primary and secondary school within the next three years will be a powerful short term as well long term testament of the Group of 8 / Africa partnership. A comprehensive social program that guarantees all AIDS orphans uninterrupted primary and secondary education and quality primary healthcare services will not only provide a brighter future for the affected children but would also be a showcase of Group of 8 / Africa relations. Fourth, African professionals living in the West should become a centerpiece of the Group of 8 / Africa partnership. These professionals continue to maintain familial, economic and social ties with their native lands. African professionals are likely to jump at any structured opportunity for them to support development initiatives in their native lands and the continent. A major obstacle to accelerating Africa’s development is the growing human resource capacity crisis in Africa. This is particularly acute in the healthcare sector as thousands of doctors and nurses leave the continent to seek career fulfillment and greener pastures in the West. Other highly trained professionals in other disciplines such as engineering, computer science and life sciences also leave for better opportunities in the West. A Group of 8 / Africa program that guarantees the salary of Western based African professionals if they work in Africa for a defined period of time in a defined target population and for a defined objective can quickly provide skilled manpower to underserved areas in the continent. The key is to minimize bureaucratic costs, and, smooth out the logistics of paying the salary of an African professional from the West who is now working for a defined period of time in Africa. The ultimate objective should be to encourage the volunteer African professional to spend a longer time in Africa and contribute to the continent’s development. Together with my colleagues, we had proposed in this medium the need for a volunteer international H.I.V./AIDS services corps as a possible mechanism for tackling the acute shortage of manpower needed to mount a credible multisectoral response to the epidemic in Africa. A bold Group of 8 / Africa initiative on African professionals will build upon the current individual efforts of various professional groups donating their time and services in various parts of Africa. This proposed initiative will focus on a multidisciplinary professional response to specific needs in specific geographical areas of Africa. It would provide opportunities for African professionals with training in fields as diverse as investment banking and other financial services, power generation and distribution, information technology and telecommunications, design and distribution of clean water and highway construction, to address ongoing critical needs in Africa. A re-invigorated Group of 8 / Africa partnership is absolutely essential as African leaders and peoples seek to reduce poverty in the continent and tackle other urgent development issues such as H.I.V./AIDS. It is important for this partnership to become institutionalized with specific goals, objectives and verifiable outcomes. It is also crucial to have transparent implementation platforms and mechanisms. Ordinary Africans and taxpayers in the West should be shown visible, verifiable evidence of positive outcomes of a stronger, more durable partnership between the richest nations on earth and Africa. Chinua Akukwe teaches graduate courses on international health policy at the George Washington University School of Public Health, Washington, D.C.